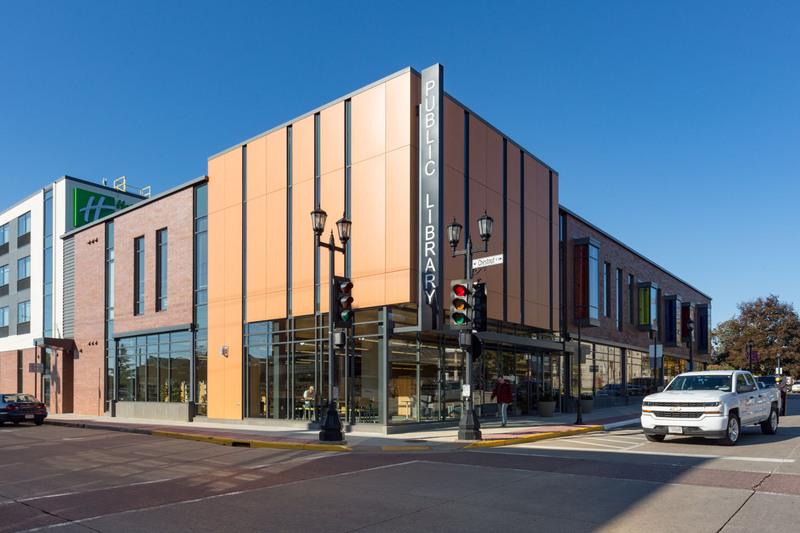 Platteville, Wisconsin’s new 22,000 square foot library enables expanded programming and community resources, and anchors planned downtown development. The library is part of the $16.2 million Platteville Library Block project, which also includes the Southwestern Wisconsin Community Action Program (SWCAP) Neighborhood Health Partners clinic and a Holiday Inn Express (which adjoins the library), all built by National Construction. It is in the heart of the community’s downtown area and just two blocks from the University of Wisconsin-Platteville. Founded in 1843, the community’s existing library facility was constructed in the 1970s, and its basement was renovated in the late 1990s for modest expansion. A single room with capacity for just 27 people was used for all on-site programming, foundation and board meetings; many programs hosted by the library and other community groups had to be held elsewhere. Aspirations for a new facility originated in 2009. The Library Block site was identified as a potential development location in the city’s 2010 Downtown Master Plan, but the project didn’t become a reality until a third round of planning, and the introduction of public-private partnership. Along with City of Platteville tax-increment financing, Wisconsin Housing and Economic Development Authority (WHEDA) and Forward Community Investments new market tax credits, a developer specializing in hotel and real estate development funded the project. The inclusion of the hotel in the project enabled the project to be a tax-paying entity. The city is leasing the property for a period of time, with the expectation that it will later be gifted to the community. National Construction worked closely with library leaders to create a flexible and accessible design that would allow the library to adapt to the educational, informational, and social needs of the community for years to come. The project began with the demolition of more than six existing buildings – single-family homes, high-rise apartments, SWCAP’s original clinic, and a business. The library raised funds to purchase wireless access points and public computers, as well as “collaborative technology” including flat-panel television screen and projectors. The library and its foundation also sought community support and grant funding for the furniture, fixtures and equipment. The new building saw an average of 3,000 visitors per week in its opening summer season, compared to about 1,500 weekly at its previous location. The library is now able to host performances, author visits, lectures and other special events onsite. The expanded facility also offers study and meeting space for UW-Platteville students and faculty, strengthening the relationship between the two prominent city entities. "It was exciting to see this project to fruition – the implementation of all of the unique design details, and the excitement of the library staff in particular. This facility is certainly a step up not only in terms of size but also in terms of style, is a great asset to the community and will be for years to come." "The role of libraries is changing ... a modern library says a great deal about what a community values. [It] adds tremendously to quality of life."